Senator Stella Oduah has denied an allegation that she bought a 1.2 million dollars house in England while she was Minister of Aviation. 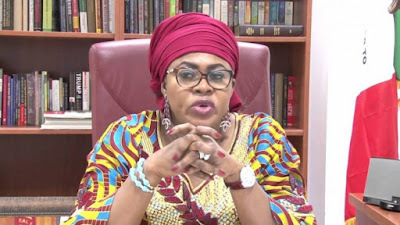 Oduah, a serving House of Representatives member, came under serious scrutiny after a report surfaced, alleging that she used public funds to purchase the house. "Of course, the allegation is not true, it cannot be true. It is unfortunate that we have a country where journalists will copy a story without verifying the authenticity of that story.When you read my statement on it later, then it will be for you to make up your mind. But, categorically it is untrue and it is unfair,". The lawmaker recalled that the same online medium had reported that she purchased two BMW cars when she was a minister. She further stated that the vehicles belonged to the Federal Government, which she never bought for herself or took away when she left the minister. According to her, "that was the same way they carried a story about bullet proof cars; bullet proof cars were never bought by me, not even by the agency they alleged. In fact, bullet proof cars were never a transaction that was not approved.They were two vehicles that were on higher purchase by the agency and the ministry directed that because of the need as proposed by the agency, they should go ahead and do the higher purchase. Suddenly, for the online medium, higher purchase turned into procurement; I don’t know if there is a similarity between higher purchase and procurement.So, I now realise and symphatise with anybody that works or tries to work for government, because you will have the likes of Sahara Reporters thrive on making your life difficult. I rise above that at all times because I know that what they say is never the truth, particularly on my case, it is not true.It cannot be true; why will I purchase vehicles on higher purchase and then it is on the ministry’s and agency’s name, why? That same vehicle, I never drove it for one day and when I was leaving the ministry, I didn’t take it along with me? The question should be `where are those bullet proof cars today?" This comment is off the news here o, minister of aviation not football. Lol. Lol.. Politicians and lies sha.. Who is fooling who? It's possible she's right, our media houses cannot be trusted any more. They are just looking for anything to post as news even fake information. That's why I stay glued to getrightnigerians where true information is shared.